Elixir Door and Metals Company Series 400 Vinyl Steel Manufactured Home doors are a step above the Series 200. 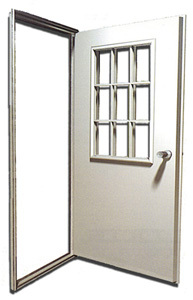 The Series 400 doors are constructed from vinyl laminated galvanized steel. The Series 400 door is more resistant to dents and scratches because the steel is over sixty percent thicker than the steel on the Series 200 door. Series 400 doors are equipped with a heavy-duty aluminum frame ensuring stability as well as safety and security. Other features include a folded edge that blocks air, light, and water penetration, highly efficient polyurethane foam insulation with high R-Values, adjustable striker plates, and bot hteh frame and door are deadbolt prepped. The Series 400 door also features weatherstripping on the door frame and on the door core creating a double seal. Four additional options also come with the Series 400 door: a swivel lock bolt, a threshold, a drip cap, and a chain. Other additional hardware items such as a dead bold and knocker viewer are also available upon request. Series 400 doors are available in an assortment of colors, sizes, and door lite options. Please contact your local Elixir Division to inquire about Elixir Entrance Doors. 32" x 76" 32" x 78" 32" x 80"
34" x 76" 34" x 78" 34" x 80"
36" x 76" 36" x 78" 36" x 80"
38" x 76" 38" x 82"